In 2012, I blogged daily in a Lenten journal. You can go day by day or read as you like. For instance, today is day 9 of the 40 days; read it here. This year I’ve a notion to create something — one meal — out of two favorite Irish dishes — colcannon (mashed potatoes with cabbage or kale and milk) and salmon, a lovely, healthy fish that thrives along Ireland’s west coastline. 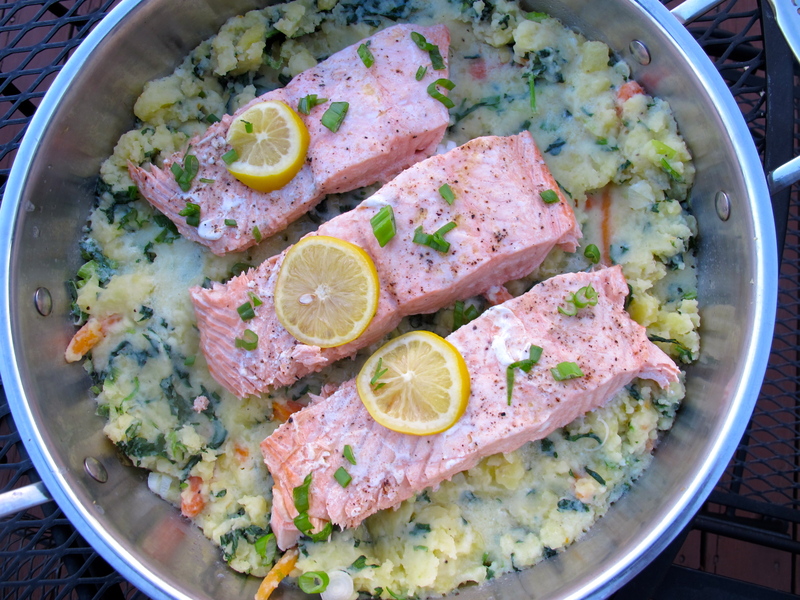 While I love both colcannon and salmon, I’ve never had them together and certainly never cooked them together in one skillet. Today’s the day, but first listen to this sweet song (click on title for link) “Colcannon,” by the Black Family– sometimes known as “The Little Skillet Pot”. Lyrics are below. And the moon began a-peeping from behind the Hill o’ Down? And you whispered loving phrases to your little fair colleen. 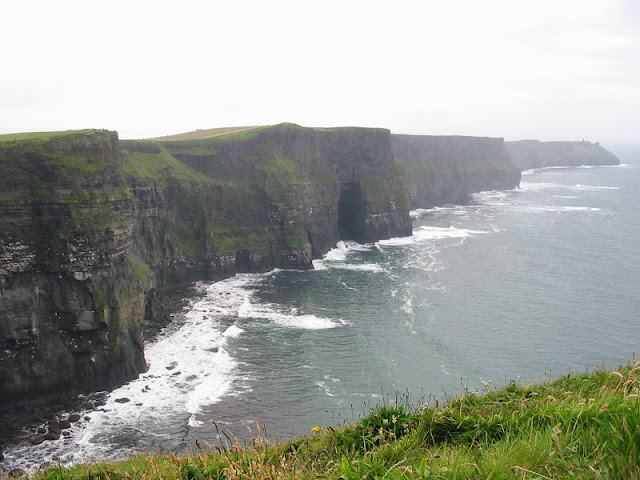 for Saint Patrick’s Day or for any Friday in Lent, if you choose that walk. 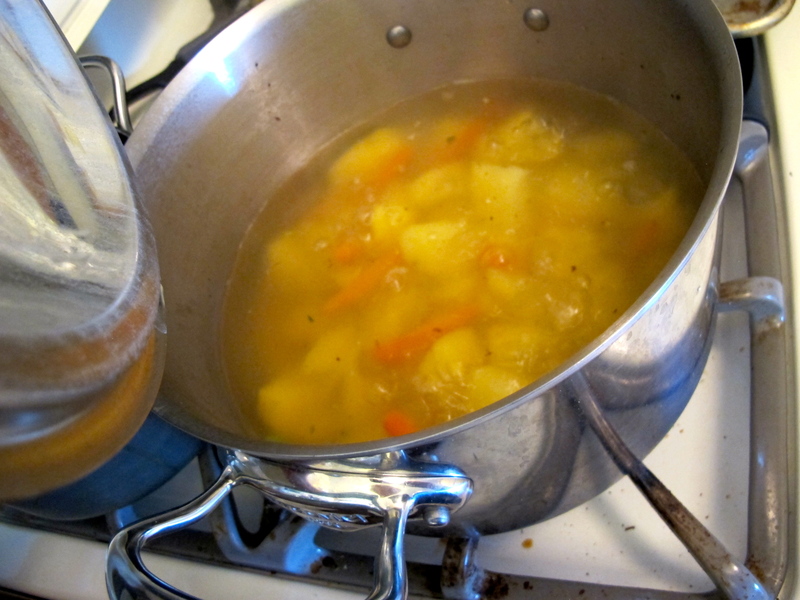 METHOD: First… Boil some potatoes with a little carrot and add some kale right at the end of the cooking time. Mash all with hot milk seasoned with green onions. 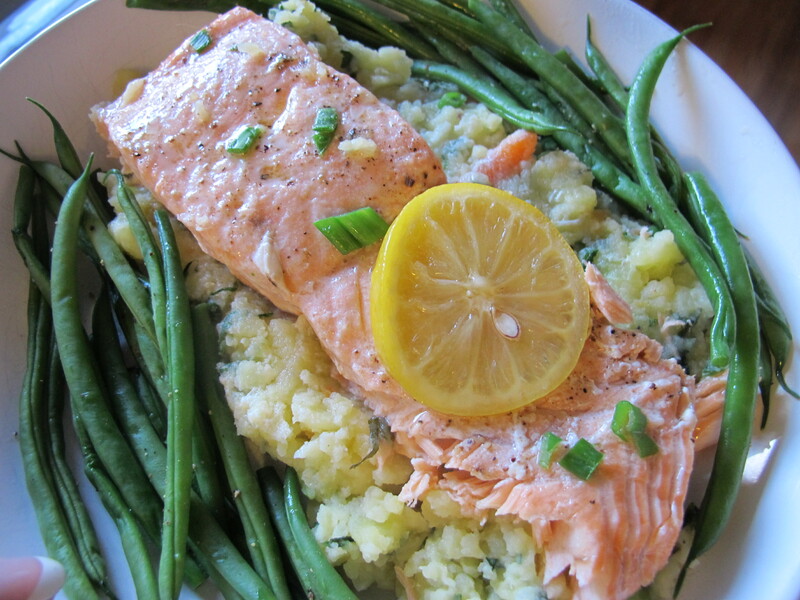 Press the potato mixture into a deep skillet and steam the salmon on top until firm, but moist and tender. 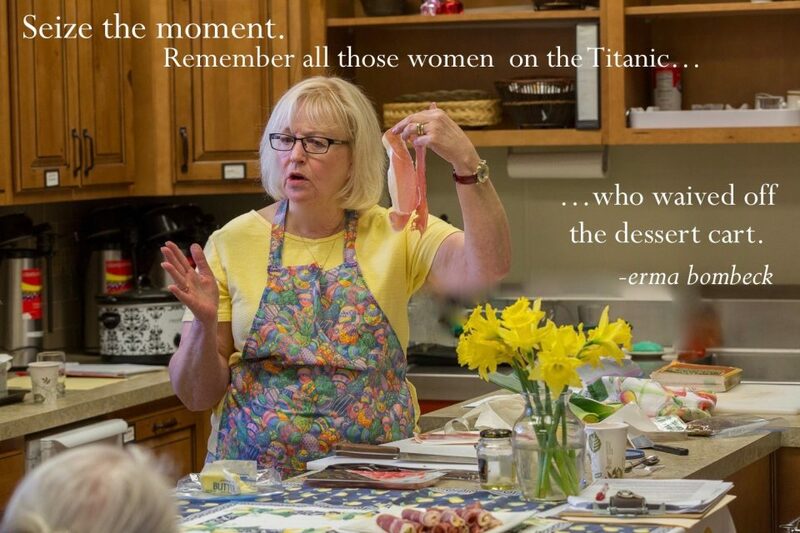 I served mine with a few buttered skinny green beans (haricots verts). Meanwhile, in a small sauce pan, heat milk and a tablespoon of butter with all but 3 tablespoons of the green onions (Reserve the 3 tablespoons for garnish). You want the milk hot, but not boiling. Keep warm until potatoes are done. Add another tablespoon of butter to the potato mixture along with 3/4 of the milk mixture; mash until as smooth or chunky as you like. Taste and reseason if necessary. 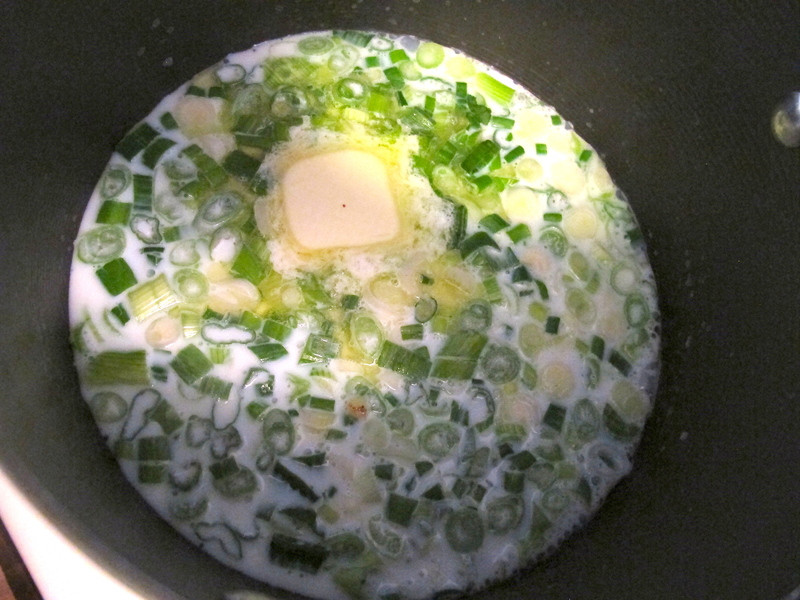 To a deep, large skillet, add the remainder of the milk-green onion mixture and heat over medium flame. 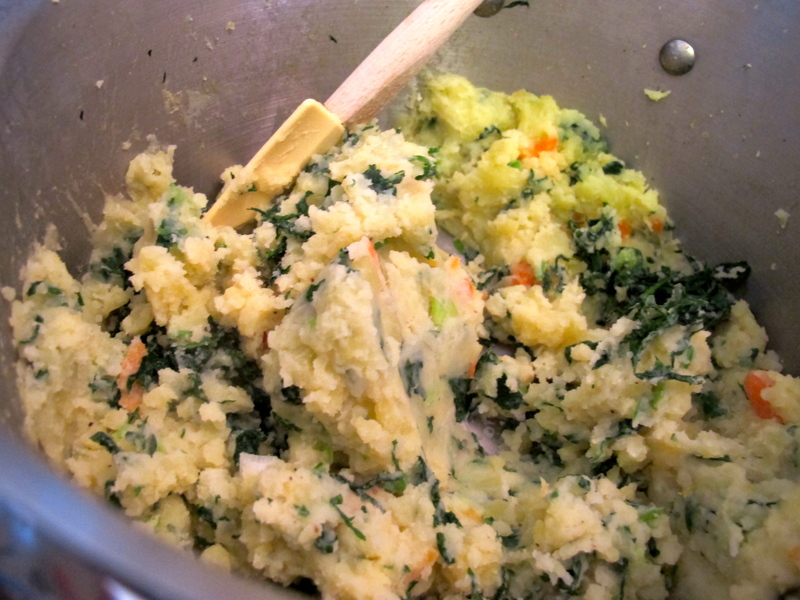 Add all of the colcannon (potato-kale mixture above) and press evenly into the pan. Lay the salmon fillets, evenly spaced, on top of the colcannon; season with a generous sprinkling of salt and pepper. Dot each fillet with a small bit of butter –about 1/2 teaspoon each — and place a lemon slice on each piece. Cover and cook until fish is opaque and firm, but moist — 8 minutes or so. Turn heat down if potatoes begin to burn. Let rest 2 minutes. 2. 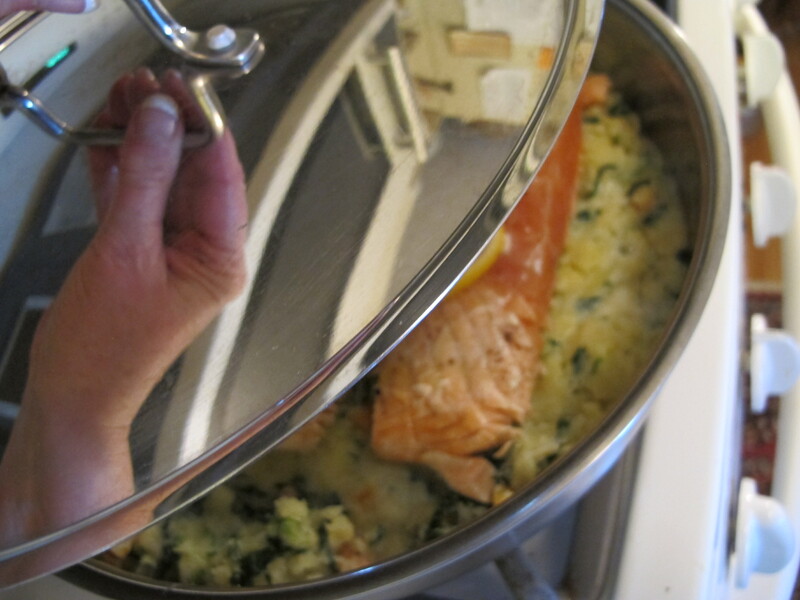 Using a long spatula, remove one whole serving of colcannon with the salmon on top, as possible, and place on a plate or pasta bowl. Add a few green beans and garnish with reserved chopped green onions. Serve hot. Pass the lemon wedges at the table. Music: There are many possibilities and they’re all wonderful. Just for fun, though, why don’t you pull out Van Morrison or U2. Both Irish and both perfect. TRADITIONAL COLCANNON RECIPE FROM DARINA ALLEN HERE. 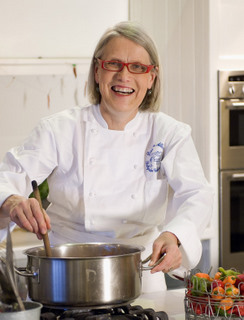 (Darina is the well-known, actually famous, Irish chef and teacher who owns and operates the Ballymaloe Cooking School in Shanagerry, County Cork, Ireland. Classes available!) See my post on Darina’s soda bread here. About fishing for salmon in Ireland, click here. If you’re to go to school at Ballymaloe, you might as well take a friend who’ll go fish for the salmon while you study and cook.